The picture in this post comes from my car windshield. For those unacquainted with the amenities of winter life, those white blotches that resemble buckshot, are the effects of a morning frost. They are icy, but are not quite ice. You could run your fingers across them and feel little, if anything. They are also not worth scraping because the frost is spread out enough on the windshield to offer just enough vision for the driver to make his or her way down the road. And if the defroster does its job, the windshield will once again be clear. 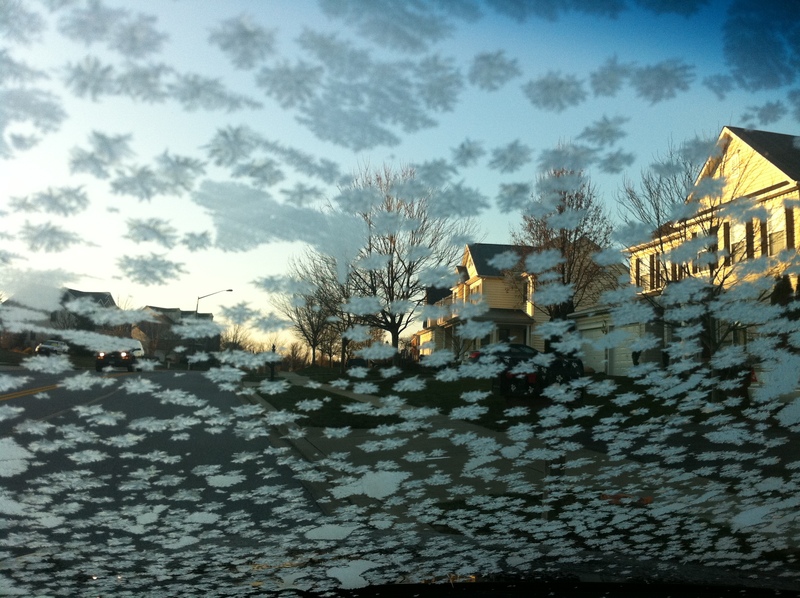 Here’s the crazy thing about frost when one is on the road – It doesn’t melt – it fades. A power struggle between defroster and wind chill rages during a morning drive. Eventually the defroster wins, but not without a fight. The wind chill is enough to service the frost’s need for cold to survive for a while, but the defroster’s power is slightly greater to heat the glass, and thus to subtly but surely dissipate its morning nemesis. Until then, one can see sufficiently, though not completely. I can’t even begin to wrap my brain around John’s promise – but I love it. One day everything will be clear – and as lovely as Jesus is right now to this forgiven sinner, there is more to see. John promises that in seeing Him ‘as he is,’ a transformation will occur – we will become like Him. It is Christmas morning, 2010, and it has been a beautiful Advent season – for our church, our family and our friends. We are grateful. Everything figures in – the worship – the music, the decorations, the trees – the food – and of course, the people. And now we reflect. For me, Christmas has always been special – our parents made sure that we took the entire season in. Celebrating with the Church has been part of that – coming together to sing the carols, sharing Christmas wishes, visiting one another’s homes, even lamenting with those encountered by sadness when others are celebrating – all part of the greater fabric of a community of people bound together in Christ’s love. Katherine and I have attempted to continue such a tradition for our children – our hope is that the sweetness of the season will always deepen their love for Jesus. In a sense, our desire is that they will see all the beauty and joy of the season as a taste – or a foretaste – of something yet to come. Symbols and comparisons fail at this point – but the promise doesn’t. While the frost of our unfinished lives slowly dissipates, we can long for a day when all will be clear and we will see Jesus face to face, and even be like Him. Friends, I can’t think of better news. You are currently reading Longing to See at unfinished1.